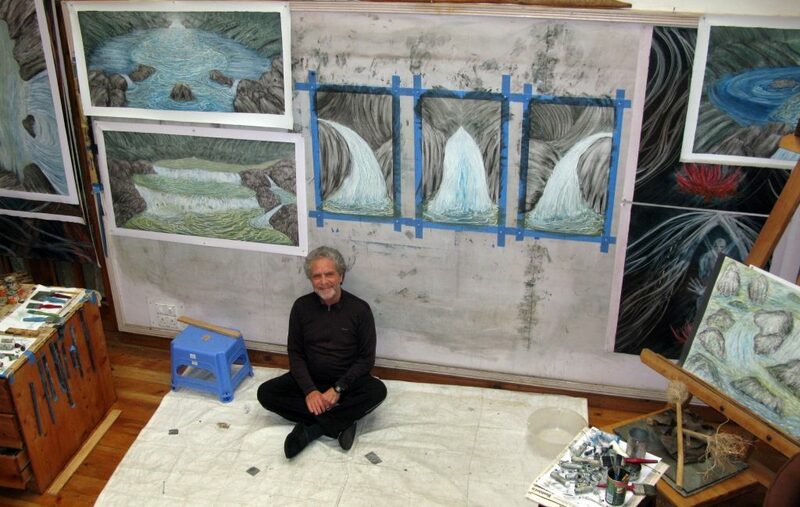 These paintings and drawings are a continuation of my deep involvement with the stream in front of our Indian Himalayan home, the Hirub. For the last ten years, the Hirub nallah/stream has fully pervaded Kamla and my living environment with its constant purring, bubbling, drumming, and roaring presence. The Hirub is continually changing its form and sound based on so many factors. This is especially true during the Monsoon storms (July-August-September) when it transforms from a crystal clear, jade-blue stream to a roaring muddy brown torrent rising up to five feet. After not painting in 2012, I was anxious returning to Behta Pani (our home/BP) wondering whether “it” was still in me. I went back to basics, going out by the Hirub, and sketching every day for hours (like practicing piano scales). My painting chops came back week-by-week, as well as moving deeper and deeper into the imagery: from more realistic to symbolic representations. We all come from the primordial Mother Sea that flows in our blood. If in some small way the Mystic Hirub and Amrit paintings remind the viewer of that connection than my life-long goal of creating beauty and interpreting Nature’s energetic forces has given me meaningful purpose.